Here’s some more food photography and for the first time a recipe! 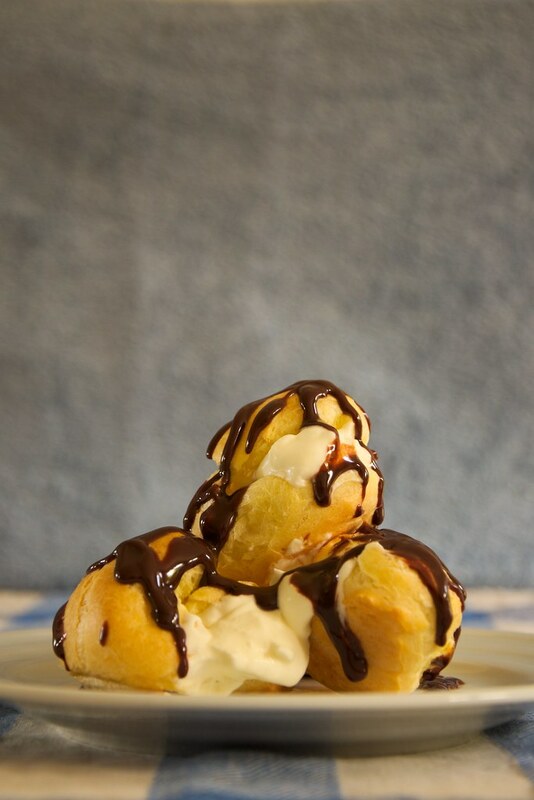 I’ll explain to you how to prepare these delicious profiteroles. Put the water, the butter and the salt in a pan and bring it to a boil. Pour all the flower in the pan, take it off the heat and stir vigorously with a wooden spatula until you obtain a ball of dough. Leave the dough in the pan and let it to cool down. Now add each egg one at a time. Be sure that the egg is well incorporated in the dough before adding the next one. Congrats you’ve just made puff pastry. Now use two teaspoons to make small balls of pastry and place them well spaced on a baking sheet. Put the tray in the oven and cook 20min. Than let the small puffs cool for about 10min with the oven door half open. During this time you can prepare the chocolate sauce by melting the chocolate (I use the microwave). Take out the cooked pastries, let them cool a couple minutes, incise them with a knife and fill them with whipped cream.